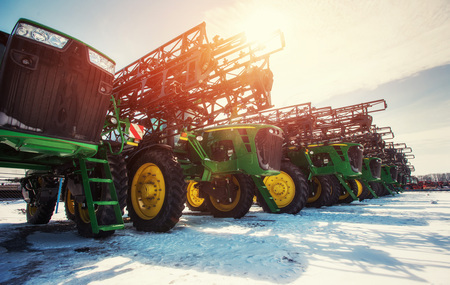 Prepare for Planting Season with Us | Wilson Auction & Realty Co, Ltd.
As winter gradually gives way to spring across the Midwest, agricultural producers are preparing for another growing season. Many farmers are also thinking about purchasing new equipment or farmland in preparation for the year ahead. At Wilson Auction & Realty, we offer a variety of opportunities to help you prepare for planting this spring. Agricultural equipment is an expensive, yet necessary, part of farming. Since quality equipment often lasts for many years, purchasing it used is a great way to acquire needed equipment while saving a lot of money. Tractors, skidsteers, balers, trailers, planting equipment and much more are all often available at a discount at agricultural auctions. In fact, it is likely that any type of equipment you need can be found at an auction. Agricultural auctions provide the perfect opportunity to find quality, used farm equipment at a fair price. Growing agricultural operations are often looking for new farmland, as well. Wilson Auction & Realty has extensive experience handling agricultural land auctions in Ohio, Michigan and Indiana. An agricultural land auction can be a great way to acquire needed farmland in a convenient venue. It’s also an option to pick up land at a more affordable rate than is sometimes available on the open market. Whether you need to purchase additional farm equipment for the upcoming season or are considering purchasing new farmland to expand your agricultural operation, an auction can provide the perfect opportunity to find what you need at a price that is fair. Wilson Auction& Realty holds a number of agricultural auctions in the Midwest each year, and brings our team’s decades of experience to each sale. This extensive knowledge helps ensure that your auction experience will be smooth and efficient, whether you purchase agricultural equipment, farmland or anything else at an auction held by Wilson Auction & Realty. The dedicated staff at Wilson Auction & Realty brings more than a century of combined experience to the auction process. Contact us today at 866-870-5500 to learn more about our services or to inquire about upcoming agricultural and farmland auctions.